Born at Sandy Lake on June 11, 1885, this grandnephew of Chief Poundmaker attended the missionary school on the Sandy Lake Reserve, and then the boarding school in Prince Albert, where he proved an able scholar and an impressive athlete. After boarding school Ahenakew returned to Sandy Lake, where he assisted his father until he was invited to teach at a missionary school on the James Smith Reserve. Wishing to continue as a missionary with his own people, he attended Wycliffe College in Toronto for two years, and then Emmanuel College in Saskatoon, from which he graduated in 1910 with a degree in theology. After his ordination, Ahenakew moved to Onion Lake and assisted the Rev. J.R. Matheson before beginning missionary work in northern Saskatchewan. He traveled by dogsled in the winter and canoe in the summer, and was warmly welcomed in the far northern communities he visited. Ahenakew also helped care for the sick who were unable to access Transportation for outside medical care, and following the 1918 epidemic he obtained leave from the church to enroll in the Faculty of Medicine at the University of Alberta. After three years of studies, however, he was forced to discontinue because of his own ill health, and returned to missionary work. Emmanuel College honored Ahenakew with the Doctor of Divinity degree in 1947, an honour previously given to only one other Aboriginal person in Canada. Ahenakew worked at Fort Ã la Corne for several years, and he and A.S. Morton (professor of history at the University of Saskatchewan) succeeded in locating the sites of several old fur-trading posts along the Saskatchewan River. Ahenakew collected and transcribed many legends and stories during those years, and in 1925 several were published as the Cree Trickster Tales. 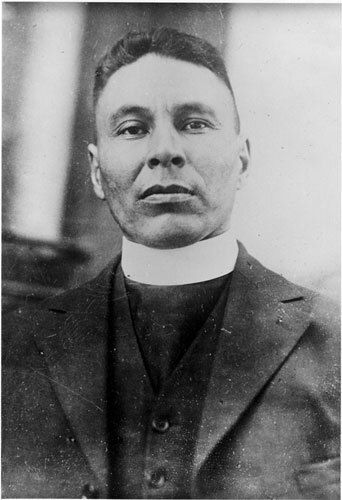 He also wrote and published a monthly magazine written in Cree syllabics, and worked with Archdeacon Faries in preparing a Cree-English dictionary. A collection of traditional tales entitled Voices of the Plains Cree, narrated by Chief Thunderchild and written by Ahenakew, was published posthumously in 1974. “Old Keyam,” a tale of the changing world of the Cree, was another of his published works. Rev. Ahenakew passed away on July 12, 1961, while traveling to Dauphin, Manitoba to help establish a summer school.